When I began in the coffee business in 1992, I read every book I could find about coffee. After reading all of those books, however, I felt as if I hadn't learned much about how to make great coffee. My coffee library was chock-full of colorful descriptions of brewing styles, growing regions, and recipes, with a few almost-unreadable scientific books mixed in. I would have traded in all of those books for one serious, practical book with relevant information about making great coffee in a café. When I began in the coffee business fourteen years ago, I read every book I could find about coffee. After reading all of those books, however, I felt as if I hadn't learned much about how to make great coffee. I would have traded in all of those books for one serious, practical book with relevant information about making great coffee in a café. Fourteen years later, I still haven't found that book. This book is my attempt to give it to them. 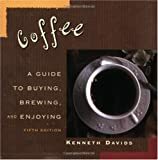 Now in its fourth revised edition, Kenneth Davids's comprehensive and entertaining Coffee: A Guide to Buying Brewing, and Enjoying remains an invaluable resource for anyone who truly enjoys a good cup of coffee. It features updated information and definitions, a history of coffee culture, tips on storing and brewing, and other essential advice designed to improve the coffee experience.Coffee lovers everywhere will welcome this lively, complete guide to the fascinating world of America's national beverage. The popularity of espresso, coffee at its purest and most intense, has grown exponentially in the past decade. 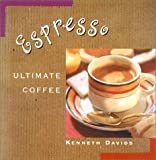 In this revised edition of his book on the ultimate coffee, Kenneth Davids provides a lucid, engaging examination of espresso's lore, legend, and culture. A finalist for the James Beard Award upon its original publication. Espresso is the perfect introduction to the world of specialty coffee. The Espresso Quest is the definitive book on Espresso Coffee. Espresso is now a global phenomenon with its popularity exploding everywhere, including the USA. The Espresso Quest will appeal both to those who make their living from coffee and those who simply can't live without it. It is written for anyone who loves coffee, good food or great wine. An amazing coffee table book about espresso coffee. In this revised and updated edition of the most authoritative guide to coffee, Corby Kummer travels the country and the world to give you all the latest information you need to make a great cup at home: The best beans and how to buy and store them, the grinder that's essential for great coffee, incisive reports on brewing and espresso-making equipment and tips on how to get the best from them; with photographs of current models, and a complete, up-to-date list of sources for beans, equipment and Fair Trade organizations. This is a pocket sized guide that shows how to select, brew, and appreciate the finest coffees and teas.